​Einstein once said that “everyone is intelligent but if you judge a fish by how well it climbs a tree it will live its whole life believing it is stupid”. Upon loosing someone very prominent in my life- and not losing them in a grave but losing them in the comfort and consistency of our friendship, sense. I have been listening to hours upon hours of motivational videos. Proving yet again that you are exactly what you consume. Be it food, energy, music… And not the self-help “get out of bed” and “somebody loves you” commercial, primary school-participation ribbon type of entitling speeches that make you feel at ease with mediocrity of your current life. So many videos try to calm you into a mutual sheep herd. Telling you what you want to hear so you don’t feel guilty for waiting time on useless pop culture antics and justifying it by feeling like everyone else is doing it, so it’s ok that you are to. Gary Vaynerchuck- who I might be developing a slight fan-girl/OMG-marry-me/adopt-me/teach-me-every-thing-you-know/I-am-the-grass-hoper crush on, did a daily blog video called #AskGaryVee . A normal call from a teeny fan turned into the benchmark breathing point for me when he broke down why this preppy sounding teenybopper- then again all American girls sound belligerently preppy to me, burdened herself with the pressure of an unrecognised object hitting earth, to reach this glamourised milestone of ‘Millionaire by 25’. Somehow this has become the end game for everyone between 20 and 24. So focused on vast wealth and success it is hard to know if millennials are driven by the dopamine of achievement or the sensation of having an Instagram page that is the envy of all their 1M followers (cue @Kylie_Jenner , the poster millennial for famous, rich and skinny under 25). In Gary’s video he breaks down why Annabell feels like 25 is end game and he breaks down who it is she thinks she’s competing with. The only name she could bring up was your actual fav KJ. She couldn’t list another name which seemed rather blindsided considering that if you’re trying to keep up with all these loads of people who have achieved exactly what you want to achieve, you’d be able to know more names than the most famous poster child encouraging this unhinged anxiety. I might be contradicting myself through syntax but it seems as though we’re all so caught up in the hype of 'young and rich’ that we’re forgetting that THERE IS LIFE AFTER 25. I used to believe (as strongly as Trump believes, well in Trump) that 30 meant you were old and as soon as you got old there were wrinkles involved you were done for and life was over. Small financial missions with wonderfully bland financial people reminded me that I can make decisions now that will benefit me when I'm 34. Age, money, time, numbers don’t lie. 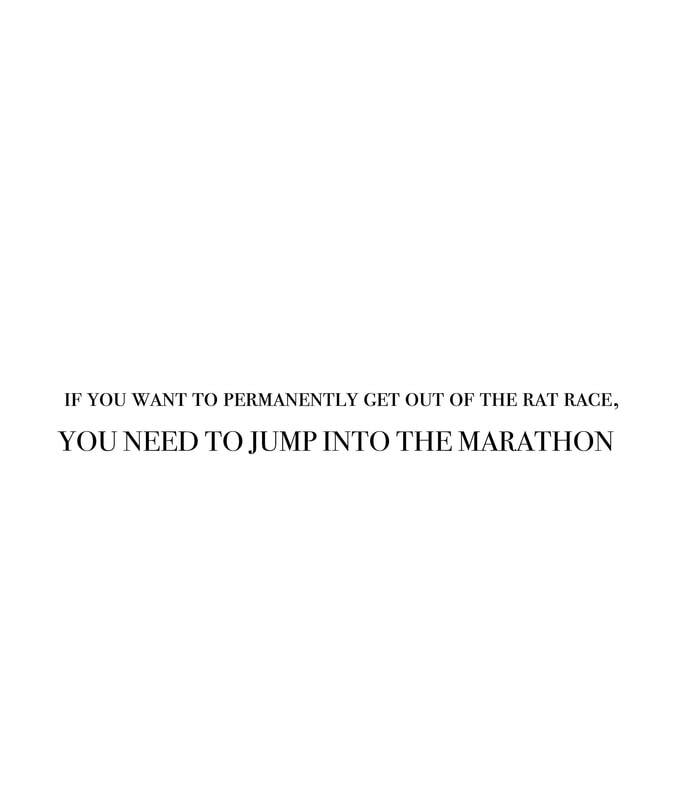 if you want to permanently get out of the rat race, you need to jump into the marathonTHERE IS LIFE AFTER 25. YOU DO NOT NEED TO REACH EVERY MILESTONE BY 25. If you are 25 and you haven’t reached mind numbing success, you need to look at what you’ve done in the last 5 years and realise thats not what is going to give you whatever it is you want. Success is genuinely available to everyone and what really sunk in with me this week is that if you want to permanently get out of the rat race, you need to jump into the marathon. Its filled with rich people and they’re kids who are being pushed down the road in Ferrari and BMW strollers by domestic helpers, Opears, IEB teachers and private tutors. Some people start closer to the finish line than others, and if they’ve really won the race they’ll make sure the run looks easy from where you’re jogging along. Comparing yourself to others in the marathon is going to slow you down, don’t pity yourself for where you stand, look at how those that have made it ran and do that. No one cares when the winner wins, they only care THAT they’ve won.